The very rare Hog Deer is the smallest Deer in Australia and also one of the toughest trophies to take. They offer great hunting and are a small and difficult target even to the experienced hunter. 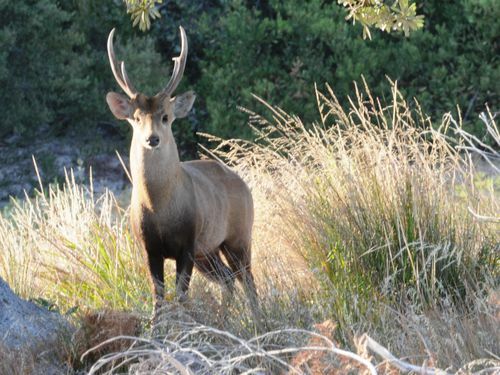 Hog Deer Open Season in the state of Victoria is in the month of April only we now have a special Licence for International Hunters to hunt Hog Deer on our property during the months of February,March and May. 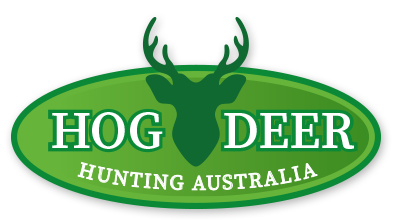 Australia is one of the very few places in the world that you can hunt the wild Hog Deer legaly. Hog Deer were introduced to Australia from India in the 1860's. The main release area was Cape Liptrap in Victoria and Hog Deer now occupy most of the Gippsland coastal area. Hog Deer are the smallest deer species in Australia a mature male (stag) stands about 70cm at the shoulder and weighs about 50kg the antlers typically have six tines and may grow to about 16 inches a good representative trophy would be 9 to 12 inches with six tines we encorage most of our hunters to harvest trophys from 13 inches upwards. Hog deer are a herd animal and are found in the coastal tea-tree swamp areas. Hog Deer are nocturnal grazers and also like to graze at dawn and dusk. Hog Deer do not like windy or wet conditions and are quite difficult to locate when the weather is bad.